General Rubber's Styles 8100LW, 8101LW and 1091 rubber slip-on sleeve type rubber expansion joints are designed with lower spring rates for reduced reaction forces and greater movement capabilities within a compact body. This optimally designed slip-on and lightweight construction represents the most cost-effective arrangement for low pressure applications. Mating flanges and hardware are not required, adding to the cost-effectiveness of this arrangement. The construction includes a high-grade leak-proof tube, a seamless cover, multiple layers of high-strength tire cord and stainless steel screw clamps. Additionally, they are designed to absorb large all-directional movements, reduce noise and vibration, have a cycle life in the tens of millions, compensate for misalignments, provide access to piping and equipment and relieve pipe and anchor stresses. General Rubber's no-arch Style 8100LW slip-on sleeve is designed with minimal reinforcement for ducting applications operating within ± 5 PSIG. General Rubber's single arch Style 8101LW slip-on sleeve has exceptional all-directional movement and is designed with minimal reinforcement for ducting applications operating within ± 5 PSIG. Additionally, they are available in multiple arches for increased movements and decreased spring rates as well as custom offsets and reducing arrangements. 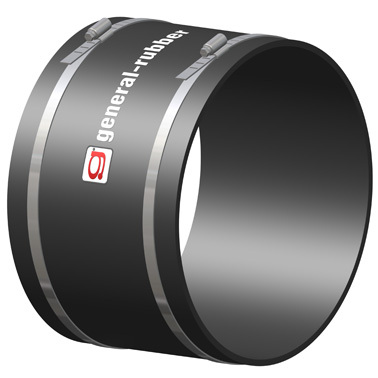 General Rubber's fully molded Style 1091 has unique beaded ends to prevent the sleeve from being pulled out from under the clamps, making this design ideal for vibrating bin activators as well as other industrial OEM equipment.